When I started reading To Hold the Sun by Chas Watkins, I have to admit I wasn’t quite sure if it was memoir, self-help, or fiction. But the copyright page tells me “this is a work of fiction. Any resemblance…” etc, so technically it’s a novel. But I found I liked it much better viewed as self-help, or perhaps philosophy. 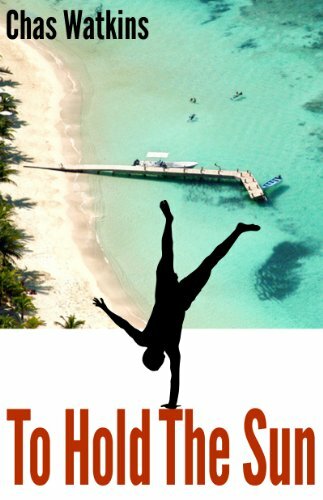 The plot is essentially the old fable, a student goes to the master and says, “Teach me your wisdom.” This particular students is an investigative journalist who is vaguely dissatisfied with his life, sent on an assignment to the Caribbean island of Roatan, there to interview Paul, a practitioner of “the art of happiness,” as well as of handstands. For a novel, it’s not much of a plot arc, and there’s no real detail or individuality to the two characters. However, once the journalist hits Roatan, the bulk of the book is spent on conversations with Paul, which are just this side of discourses. And even though the fiction didn’t do much for me (and was a bit distracting), I liked the philosophy. Paul’s (or Watkins’) lessons are a kind of blend of philosophy, self-help and psychology. There are discussions of meditation practices, directing one’s thoughts, neurological biases, the values and disadvantages of goals…and other similar lines. I can’t say there were a lot of new ideas, but I liked how they were pulled together and presented. If this book sounds interesting to you, you’re in luck! The author is offering a giveaway. If you’d like to enter, please leave a comment below with one thing in your life you’re grateful for. The giveaway closes in two weeks on August 6th, so comment today! Check out the iRead Book Tour! Disclosure: I received a free copy of this book from iRead in exchange for an honest review. The philosophy part sounds engaging. So was there actually a fiction part, too? What was that about? Was it mostly descriptive? Did it just talk about how the journalist got to the island, interviewed the “happiness practitioner” and then returned home? I guess the story, such as it is, is more a frame for the philosophy. The fiction was clearly only a frame for the philosophy–it was very minimalist and mostly just described the journalist arriving on the island and sitting down to talk with the teacher.